Pass valid for 1, 2, 3 or 5 days on Bus, Metro, RER, and Ile-de-France (Transilien) trains & trams (not TGV). Pass valid on OrlyVal train to/from Orly Airport to Paris (with 5 zone pass). Paris Visite pass counts days from day of first use, not 24 hour periods. If you arrive at night and use the pass before midnight, that will be counted as one day. 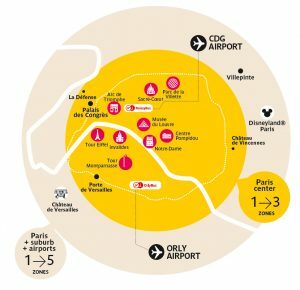 The Paris Visite Pass is a 1, 2, 3 or 5 day pass good for either Zones 1 to 3 or 1 to 5 around Paris. 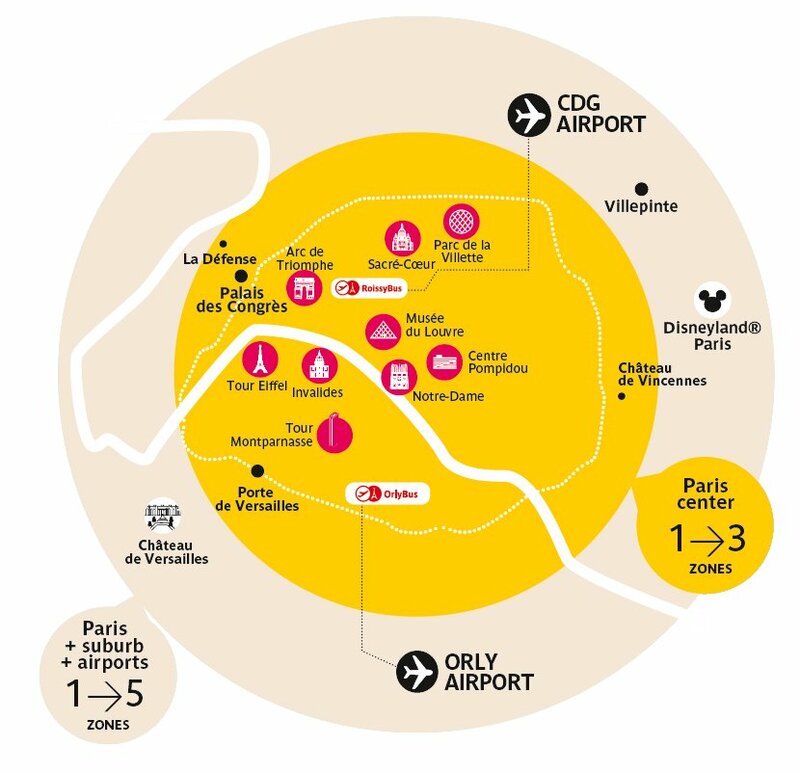 If you’re staying just within Paris itself and not venturing out to Chateau Versailles, Chateau Fontainebleau nor Disneyland® Paris (all of which are in zones 4 & 5), stick with the Zone 1 to 3 card, which will cover all of “central” Paris. See the Paris Fare Zones Map for more information. The key difference between the Paris Visite Pass and the Navigo Découverte Pass is the timing. Navigo passes are valid strictly from Monday 00:00 to Sunday 23:59:59. If you land at CDG Roissy-Charles de Gaulle Airport on Thursday and buy a week long Navigo Découverte pass, it will work only up until Sunday midnight. Starting from Friday, you will not even be able to purchase Navigo pass for use in the same week. Paris Visite pass is good from the day of first use (not time of first use) up until midnight of its last day of validity, starting from any day of the week. This means that if you arrive on Friday evening at 8pm, buy and use a 3 day Paris Visite pass, by midnight that night (four hours later), the card will have “used” an entire day and in two days (Sunday) at midnight the Paris Visite will have expired. So to maximize the value of the Paris Visite Card, start using a Paris Visite pass during the morning. If you’ve arrived in the evening at one of the Paris airports, simply buy a single-use RER ticket from a ticket window that will get you into Paris (see prices for CDG to Paris from CDG, vs. 1 day Paris Visite 5 Zone ticket listed above). You can purchase a Paris Visite at the same time and begin using it at any time in the future. The 3 or 5 day validity period of Paris Visite does not begin until you first validate the ticket in a turnstile / fare-gate in a station or on a bus/tram. 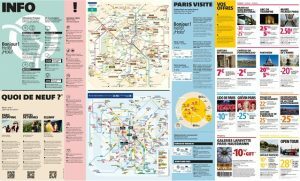 In summary, if you’re arriving in Paris on Friday and want to have an unlimited Paris transit pass for 3 or 5 days, this is the least expensive pass (Mobilis pass may be cheaper for 1 or 2 days depending on number of zones). In addition, there are discounts for various tourist attractions and services for Paris Visite pass holders, such as 25% off boat tours on the Seine, 20-40% off admission to the Arc de Triomphe, the Opera house, the Pantheon, and other sights and services. Paris Visite pass discounts change often so use the discount list below as an example of discounts you may get when purchasing a Paris Visite pass (a booklet detailing all of the discounts available to you will be provided upon purchase of the pass). These discounts change often so this list of Paris Visite discount offers is only meant as an example of savings.